I am so incredibly happy to continue my work with Dermalogica. My loyal partner and comfort in times of bad nights, age crisis and hormonal break outs. Although, I never felt anxiety over turning thirty, I have to say, it’s been a bit harder than I thought to accept the visible changes I have to deal with now in comparison to the twenties. Ah, the carefree twenties. Why didn’t I understand to appreciate my peachy smooth skin there and then? The effort I go through to feel fresh and nice requires much more and the price I pay for occasionally basing my decisions on what’s fun over what’s good for me, leave traces. My skin is as you know sensitive to everything. It’s also thin, which makes my veins clearer. The changes I have seen are lines and less firm skin. Especially in the neck area. 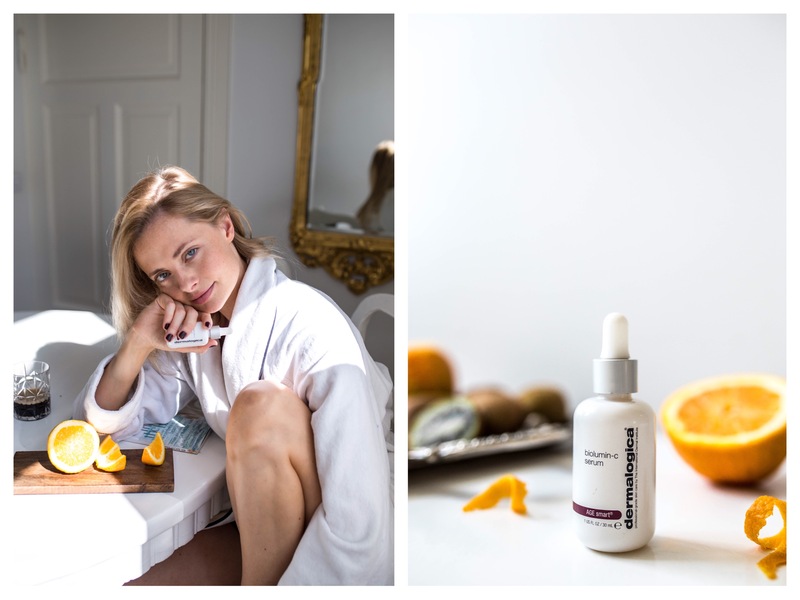 Instead of giving into the temptation to go for more radical procedures, I turned to my skin specialist at Dermalogica, who finally gave me the permission to start treating my skin with smart aging products. Loving that there are some benefits with crossing the magical line of thirty. The changes I made, were to put more focus on peeling products, serums to meet my skins specific needs, moisture and good sun protection. What I find most important and fun, are serums. I see serums as thirst reliefs to whatever need my skin has right this moment. It’s easier to keep the rest of the skin care routine the same and focus on switching serums to match and meet changing individual needs. I got to try the newly released BioLumin-C serum. 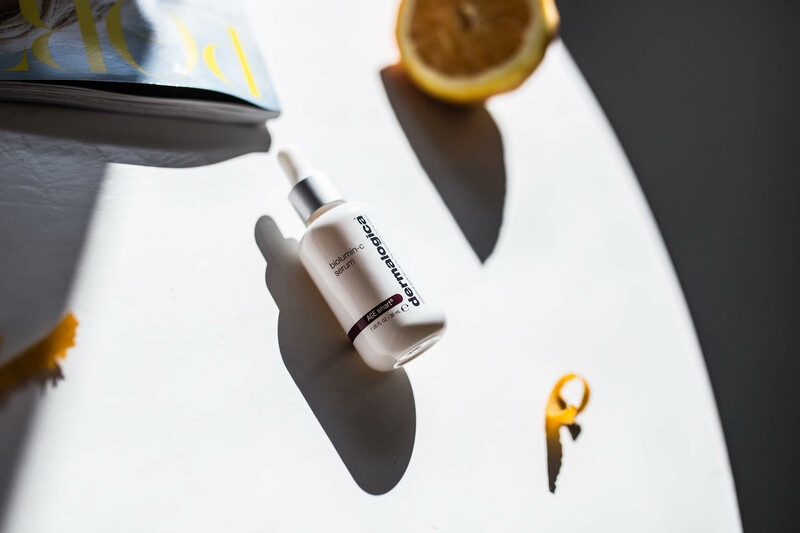 During our meeting at Dermalogica I asked everyone around me what their favorite product was and the answer of the majority was by far this serum. Now when I’ve used it for some time, both morning and night, it has earned its way into my routine. It promises to make skin more radiant and firm. C-vitamin reduces signs of aging, lines and protects from free radicals. Sounds promising, right? The change I notice is firmness in my skin and since my biggest area of interest was my neck, I see and feel results especially in this area. I apply my serums after cleaning my skin, before carefully tapping in my moisturizer. If you’re interested to know more click HERE. This product is vegan and not tested on animals. Biolumin-C Serum on tehoseerumi, joka tekee ihosta kiinteämmän ja kirkkaamman. Se vähentää pieniä juonteita, ryppyjä sekä pigmentti muutoksia ja suojaa ihoa vaurioilta. Seerumin avulla ihoon kulkeutuu biotekninen C-vitamiiniyhdistelmä ja solujen uusiutumista edistää myös tuotteessa esiintyvä maitohappo . Pagodipuun kukkauute auttaa ihoa palautumaan sekä rauhoittumaan ja chiasiemenöljy ehkäisee vapaita radikaaleja. Itse koen, että seerumi on tehnyt ihostani kiinteämmän varsinkin kaulan alueella. Levitän seerumia aamuin sekä illoin ennen kosteusvoidetta. Seerumi ei sisällä keinotekoisia väriaineta tai tuoksuja. Lisäksi tuote on parabeeniton, gluteeniton, vegaani ja testattu ilman eläinkokeita.